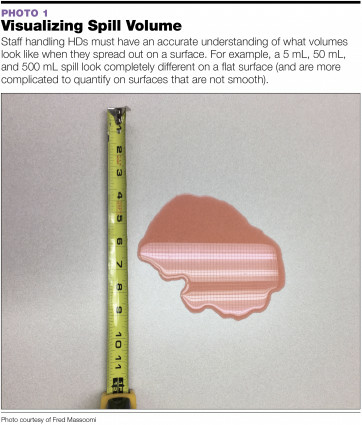 The prevalence of HD spills in health care is likely under-documented, as it is not uncommon for staff to fail to recognize when a spill incident has occurred. For example, a staff member may simply “clean up the mess,” without recognizing the serious nature of HD contamination. A study evaluating nursing practices found that HD spills are a significant problem in oncology, where 9% of 1,954 nurses surveyed experienced a spill within the week prior to the survey.2 To identify a site’s spill prevalence, pharmacy should review documentation, not only from pharmacy, but also from nursing and environmental services, and compare documented spills against the use rate of HD spill kits. A comprehensive spill program must include spill education, minimization, control, clean-up, and documentation. Robust spill management allows sites to fully assess the risk of environmental contamination, the skills of staff handling HDs, and the organization’s ability to track and trend spill data. A failure to formally clean and remediate spills allows HD residues to persist on surfaces; because residues do not go away on their own, having a formal spill management program in place is vital to the safety of the staff and the environment. Regulatory information guiding the management and control of HD spills centers on protecting the individual responsible for addressing the spill. 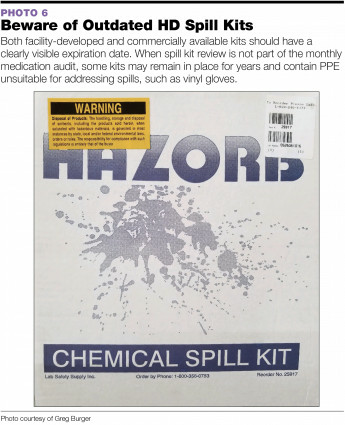 The United States Department of Labor Occupational Safety and Health Administration’s 2016 document, Controlling Occupational Exposure to Hazardous Drugs, provides key information regarding regulatory compliance for HD spills, including definitions and guidelines to protect employees.3 The Hazard Communication section requires employers to properly alert, educate, mitigate, follow-up, and document a specific program that is in place to protect staff from HDs. As such, sites that handle HDs must “develop, implement, and maintain at the workplace a written hazard communication program for employees handling or otherwise exposed to chemicals, including drugs that represent a health hazard to employees.”4 The Guidance section on spill control requires sites to maintain Safety Data Sheets (SDSs, formerly Material Safety Data Sheets, or MSDS) for each drug. The SDSs must include essential safety information, including spill procedures. 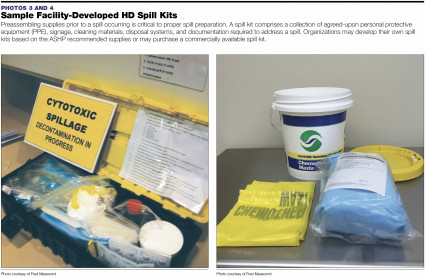 Interestingly, a review of existing SDSs from manufacturers demonstrates a lack of consistently robust spill procedures; therefore, sites should develop and implement in-house HD spill policies and procedures (P&Ps) for addressing HD spills.4 Although commercially available spill kits contain valuable supplies and information, most of the information provided therein relates to general spill cleanup. Much of the OSHA document, as well as the USP <800> recommendations for managing spills, are built on the recommendations laid out in the 2006 American Society of Health-System Pharmacists’ ASHP Guidelines on Handling Hazardous Drugs recommendations.5 This document, which is currently in the review process, provides health care workers with the most current data and processes for addressing HD spills. State boards of pharmacy that wholly adopt USP standards for compounding, including USP <800>, reference the 2006 ASHP document for spill management details. Since USP has historically provided guidance to the practice of pharmacy, the USP <800> guidance for nursing handling and drug administration is new, and sites must include best practice guidelines developed by the Oncology Nursing Society (ONS) as an adjuvant to the ASHP, OSHA, and USP <800> documents when educating nursing. It is inevitable that spills will occur, so sites should expect them. Even with excellent processes in place to prevent spills, sites will occasionally receive broken drugs vials, medical devices may fail, and unpredictable events outside of normal processes will occur that can contribute to a spill. Therefore, any organization managing HDs should consider spill management an integral element of the HD handling process. To ensure staff safety, nursing and pharmacy leadership, in partnership with institutional administration, should make implementing a robust spill management program an organizational priority. To begin, pharmacy and nursing must work collaboratively to map out the site’s complete HD workflow, from the receiving dock through drug disposal. Each step in the medication-use process presents a potential spill risk. Consider the staff members involved in each step of the process for possible inclusion on the HD spill team. Some facilities may have a hazardous materials quality team in place to address all hazards (not only HDs); if this is the case, be sure to define each team’s responsibilities to minimize duplication of efforts. The HD spill team typically comprises staff from pharmacy, nursing, surgical services, environmental services, risk management, employee health, and safety officers. The team should review the OSHA, ASHP, and ONS spill management guidance; in addition, note that USP <800> provides critical information regarding utilizing a cleaning process that incorporates deactivation, decontamination, and cleaning. Discuss the actions required to address different spill volumes; spill types, such as liquid versus powder; spills within a primary engineering control versus outside; spills in a public area; spills on absorbable materials such carpet, furniture, and wall paper; spill documentation; spill kit contents; and spill exposure follow-up. Sub-sections of each defined risk point should be delineated to address spill risks, requirements, and special equipment needs (eg, resealable plastic tote bags to transport HDs, and access to spill management materials [spill kits] and respiratory-protectant devices in the receiving areas). Educating staff is critical to ensuring proper spill management. Staff must have a clear understanding of what constitutes a spill, addressing spills of multiple volumes, emergency contacts that may be required when addressing a spill, spill kit location(s), and required spill documentation. Training for spills must be a formal, required element of employment and should be documented accordingly. Annual re-education must take place to alert staff to any new hazards—eg, inclusion of a new viral vector-based drug. Any changes to the spill kit contents and any new tools used for spill mitigation must be included in training. Staff handling HDs must have an accurate understanding of what volumes look like when they spread out on a surface (see PHOTO 1). Consider that a 5 mL, 50 mL, and 500 mL spill look completely different on a flat surface (and are more complicated to quantify on surfaces that are not smooth). The ability to estimate volumes, if the amount spilled is unknown, is key for staff to understand when they are able to safely handle a spill themselves versus when they may require assistance. It is also critical to understand that the viscosity of liquid formulations can affect the ability to properly clean a spill. Some viscous liquid formulations, including paclitaxel and megesterol suspension, may leave a sticky residue and may require further dilution with water to adequately absorb and clean the spill. Solid spills can present in the form of a bulk powder, powder for reconstitution (sterile and non-sterile), tablets, capsules, and nanoparticles. Solid HD spills present a unique situation, because some powders (eg, those that are lyophilized) may be electronically charged, may seek contact with an opposing charge surface, and are easily blown around by room air and personnel movement (see PHOTO 2). 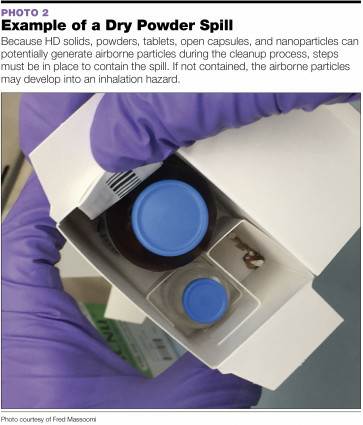 Because HD solids, powders, tablets, open capsules, and nanoparticles can potentially generate airborne particles during the cleanup process, steps must be in place to contain the spill. If not contained, the airborne particles may develop into an inhalation hazard. Cleaning processes must be established to minimize the generation of dust and particles. This can be accomplished by dampening the solid with a water mist (if the material is not water-reactive) or by covering the material with a damp, absorbent pad and using this pad to address the spill. Reactive materials—for example, spontaneously combustible materials—complicate the ability to clean up a solid spill, as they may need to be covered with oil to protect them from air. Check SDSs and manufacturer recommendations for specific requirements; however, use of these products is extremely rare in pharmacy. Recovery of nanoparticle-based drugs presents the challenge of capturing the particles and preventing aerosolization using a highly specialized HEPA-filtered vacuum. As these technologies emerge in drug therapies, clear steps to manage these spills must address both the HD component and the physical characteristics of the nanoparticle. Gaseous HD spills may occur if a liquid or solid formulation of a drug has the ability to change physical phases at room temperature. The following HDs are known to be capable of undergoing a physical phase change (including, but not limited to): carmustine, cisplatin, cyclophosphamide, etoposide, 5-fluorouracil, ifosfamide, nitrogen mustard, and thiotepa. It should be noted that not all drugs have been tested for physical phase changes; the drugs listed here are the most studied and best understood. It cannot be assumed that a new drug or a research drug does not change physical phase. The concept listed within the solid spill control section, covering with a moist, absorbent pad, may minimize vaporization. The fitted, NIOSH-recommended N-95 or N-100 masks are able to address aerosols and particulates, but not vapors; sites should also have available a chemical cartridge respirator or powered air-purifying respirator (PAPR) designated OV/CN/CS for the listed drugs that potentially vaporize at room temperature and powder. Preassembling supplies prior to a spill occurring is critical to proper spill preparation. A spill kit comprises a collection of agreed-upon personal protective equipment (PPE), signage, cleaning materials, disposal systems, and documentation required to address a spill. 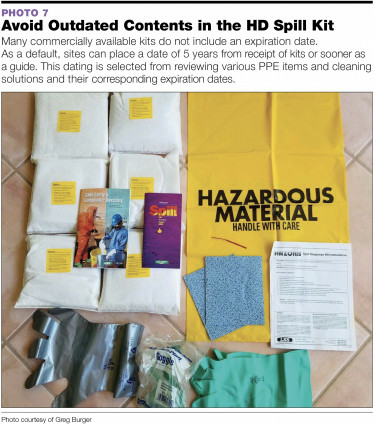 Organizations may develop their own spill kits (see PHOTOS 3 and 4) based on the ASHP recommended supplies or may purchase a commercially available spill kit. Note that commercially available spill kits are offered in multiple forms and contain varied cleaning supplies/tools and sizes of PPE. In most cases, the basic materials are present in these kits; however, there may be useful items missing or new cleaning devices included that require additional training—eg, absorbent powders, absorbent pillows, spill mitts, detergents, etc. 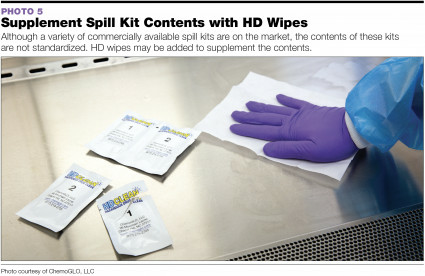 HD wipes may also be added to supplement the contents of commercially available spill kits (see PHOTO 5). Although a variety of commercially available spill kits are on the market, the contents of these kits are not standardized. Kits may be designed to address a specific function in a spill scenario—for example, drug compounding, administration, or home drug administration. Due to these differences, sites must work with at-risk staff to ensure kits match the needs of the specific duties defined. Commercially available spill kits may be packaged in a corrugated cardboard box, non-corrugated cardboard box, sealed plastic cover, resealable plastic tote bag, or in waste buckets. If sites choose a kit with a corrugated cardboard box, it should be placed in a resealable plastic tote bag in cleanroom suites and containment-segregated compounding locations to minimize particulate generation from the cardboard and to ease monthly cleaning. Sites that purchase commercially available spill kits must train their personnel on how to use the kits correctly. Be sure that standard operating procedures (SOPs) match the kits’ contents. In most instances, commercially available kits include directions for use on the external packaging or on an accompanying insert. Sites should use these instructions to supplement their internal SOP development. Each kit has limitations for its use; for example, a kit may address a limited volume and/or may contain only certain sizes of PPE. Blindly ordering kits without reviewing the kits’ contents will lead to downstream issues that may result in an unintended occupational exposure. 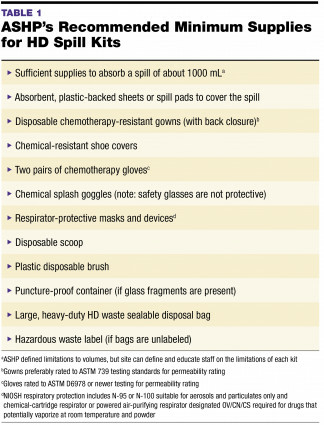 ASHP summarizes the minimum supplies that should be included in an HD spill kit (see TABLE 1 below). Addendums to spill kit contents may include: a simple pictogram illustrating use of the kit, signage to post for notifying individuals of an active spill event (per USP <800>), site-specific cleaning solutions/products, a spill event documentation form, and a list of additional supplies based on spill type (eg, water for solid/powder spills). Both facility-developed and commercially available kits should have a clearly visible expiration date. For example, some kits may be in place for years and may not contain PPE suitable for addressing spills, such as vinyl gloves, or outdated PPE (see PHOTOS 6 and 7). Many commercially available kits do not include an expiration date. As a default, sites can place a date of 5 years (this dating is selected from reviewing various PPE items and cleaning solutions and their corresponding expiration dates) from receipt of kits or sooner as a guide. Over time, PPE and cleaning solutions will deteriorate and may be ineffective to protect personnel. Spill kits should be included as part of the monthly inspection for medications and supplies to ensure products are in-date and stored appropriately; expired products should be replaced. Best practice is to ensure a visible, auditable expiration date appears on every spill kit. It is critical that staff knows where spill kits are located and can access them quickly. To this end, spill kits must be readily accessible and their location visually prominent to staff. Evaluating the site-specific flow of HDs into and out of the facility will help identify areas where spill kits should be housed. In most facilities, kits are located within the compounding and drug administration areas. In addition, USP <800> states that a spill kit must be accessible in the pharmacy receiving area. Additional areas to consider for spill kit deployment include the shipping and receiving dock (not just the pharmacy receiving area); HD compounding areas (sterile and non-sterile); surgical core stations; environmental services department; infusion center nursing stations; medication preparation rooms of patient care units where HDs are administered (eg, oncology, immunology, rheumatology, urology, ophthalmology, neurology, etc); and the waste storage locations. Considerations for home infusion and remote infusion locations should include forward-deployed HD spill kits with nursing personnel servicing these locations. It is quite common for spill kits to be stowed away in cabinets or desks. When choosing the locations for spill kit placement, keep in mind the requirement that they be visually prominent. Spill management SOPs should include comprehensive information to address any type of spill. As mentioned earlier, OSHA, ONS, an USP refer to the 2006 ASHP guidance regarding the key steps to address HD spills in the pharmacy, nursing units, and within a primary engineering control. Each of the site-specific identified risk locations (eg, receiving, drug administration, disposal of wastes) should include specific aspects of the processes utilized in those areas and should appear in the governing SOP. Assess the size and scope of the spill. Call for trained help, if necessary. Obtain spill kit and respirator, if needed. Spills that cannot be contained by two spill kits may require outside assistance. Don PPE, including double gloves and respirator. Once fully garbed, contain spill using spill kit. Carefully remove any broken glass fragments and place them in a puncture-resistant container. Absorb liquids with spill pads or toweling. Absorb powder with damp disposable pads or soft toweling. Spill cleanup should proceed progressively from areas of lesser to greater contamination. Completely remove and place all contaminated material in HD waste disposal bags. Rinse the area with water and then clean with detergent, sodium hypochlorite solution, and neutralizer (if the area may be bleached; if not, use detergent and rinse three times). Rinse the area several times and place all materials used for containment and cleanup in disposal bags. Seal bags and place them in the appropriate final container for disposal as hazardous waste. Carefully remove all PPE using the inner gloves. Place all disposable PPE into disposal bags. Seal bags and place them into the appropriate final container. Remove inner gloves, contain in a small, sealable bag, and then place into the appropriate final container for disposal as hazardous waste. Once a spill has been initially cleaned, have the area re-cleaned by housekeeping, janitorial staff, or environmental services, per facility policy. Spills occurring in a C-PEC should be cleaned up immediately. Obtain a spill kit if the volume of the spill exceeds 30 mL or the contents of one drug vial or ampule. Additional HD gloves should be worn to remove broken glass in a C-PEC. Care should be taken not to damage the fixed-glove assembly in a CACI. Place glass fragments in the puncture-resistant HD waste container. Thoroughly clean and decontaminate the C-PEC. Clean and decontaminate the drain spillage trough located in the C-PEC, if so equipped. If the spill results in liquid being introduced onto the HEPA filter, or if powdered aerosol contaminates the “clean side” of the HEPA filter, use of the C-PEC should be suspended until the equipment has been decontaminated and the HEPA filter replaced. Contaminated reusable items (for example, glassware and scoops) should be cleaned with mild detergent and water after use. Items contaminated with HDs should be washed twice with detergent by a trained employee wearing PPE as described in the PPE section. OSHA, ONS, and USP <800> clearly articulate the requirement for personnel training. Training should include education on HD risks, the facility’s mitigating processes to minimize risks to employees, proper HD handling, a list of locations where HDs are handled, spill management SOPs, spill kit locations, spill kit content-specific training, proper decontamination/deactivation/cleaning processes, training on respiratory-protective devices, and hazardous spill documentation requirements. Personnel who have been identified as at-risk should be educated upon hire and at least annually thereafter. Staff members must acknowledge in writing that they have received education and that they understand the information they have being given. In addition, the employer should state in writing that the required education has been provided. Implementing mock “spill drills” is an effective way to demonstrate facility competency. Drills should have a strategic goal, such as underscoring timeliness in addressing a spill, reinforcing the documentation process, or addressing spills in obscure locations within a facility. An observer and a timer should be present to document the staff’s actions during the drill. Present the drill results to designated quality or safety committees and include results in the site’s employee safety program for accreditation surveying bodies. All supplies used in addressing an HD spill must be considered contaminated and not be reused. Absorptive materials used to contain the spill are highly hazardous and should be placed in the appropriate waste stream as defined by the site based on state and federal standards; in most cases, this bulk waste should be classified as EPA RCRA hazardous waste. All PPE used for cleaning a spill should be considered contaminated; however, if the PPE components are not grossly contaminated, they may be treated as trace hazardous waste and placed in the yellow waste stream. Sites should work with contracted waste haulers to address HD spill waste based on state and federal regulations. If any personnel were exposed to HDs as a result of the spill, this information should be conveyed to employee health immediately. Review information from actual spill events and spill drills to identify potential safety gaps and make any necessary revisions to P&Ps. This approach will maximize the protection of staff, the public, and the environment. Organizations should consider establishing procedures to address spills caused by patients, including education of patients and family members. For example, specific instructions should include notifying staff and not attempting to address the spill themselves. A 2004 NIOSH alert addresses concerns with peri- and post-therapy contamination of the patient and corresponding linen and body fluids.6 SOPs should address emesis or spills of a patient’s body fluid during or immediately post-therapy, including use of an HD spill kit or blood and body fluid spill kit, and identify who is responsible for addressing these spills. Sites should also consider SOPs for addressing spills of body fluids in restrooms for patients on or post-HD therapies. Patient mobility is critical to recovery. In some cases, patients are allowed to roam halls and enter highly populated public areas while their therapy is being administered. It has been documented that spills can occur in this situation. Adjuvant services and care of a patient on therapy or post-therapy in radiology, physical therapy, laboratory, physician offices, and in departments servicing active patients should have a plan in place to address patients entering designated areas with ongoing therapy. If patients are permitted to move about the hospital, they should be informed that if a spill occurs, they are to contact staff immediately and not attempt to clean the spill themselves. While every effort should be taken to avoid and prevent HD spills, these spills will inevitably occur. Thus, a complete HD spill management strategy must be developed and implemented in the hospital. Ensure the proper PPE, supplies, and spill kits are present in all areas where an HD spill may occur, and be sure staff handling HDs are educated and trained. Advanced planning is critical to ensuring spills are safely decontaminated, deactivated, and cleaned. USP <800> Hazardous Drugs—Handling in Healthcare Settings. First Supplement to USP 39–NF 34 Physical Tests. www.usp.org/compounding/general-chapter-hazardous-drugs-handling-healthcare. Accessed August 14, 2018. United States Department of Labor. Occupational Safety and Health. Controlling Occupational Exposure to Hazardous Drugs. www.osha.gov/SLTC/hazardousdrugs/controlling_occex_hazardousdrugs.html. Accessed August 14, 2018. Gonzalez R, Massoomi FF. Manufacturers’ recommendations for handling spilled hazardous drugs. Am J Health Syst Pharm. 2010;67(23):1985-1986. American Society of Health-System Pharmacists. ASHP guidelines on handling hazardous drugs. Am J Health Syst Pharm. 2006;63(12):1172-1191. National Institute for Occupational Safety and Health. NIOSH Alert: Preventing Occupational Exposure to Antineoplastic and Other Hazardous Drugs in Health Care Settings. www.cdc.gov/niosh/docs/2004-165/.